Join us for a fundraiser at Chipotle Goodyear to help raise money our next Senior Trip. This only applies to in-store orders (online orders do NOT count). Present this flyer when ordering to earn money for the Class of 2020 Senior Trip. Trivium Prep students are invited to wear their Trivium Spirit Wear shirts OR this season's Trivium Prep sports uniform tops (shirts must have sleeves underneath, if they are a tank style) on this day along with the rest of their uniform. Show your school spirit! Present this flyer when ordering to earn money for our school! The Trivium Prep High School Musical Theater Club present "Anything Goes" on the Trivium stage! Doors open 30 minutes prior to showtime. Enter through the gym. Look for ticket sales coming soon! Come hear about all the great things the PSO is doing and learn how you can get involved! Join us in the Library on Monday, April 29 at 9 AM for our quarterly PSO General Meeting/Coffee. Meet other parents, share ideas and hear about upcoming events. Young children are welcome to attend with you. We hope to see you there! 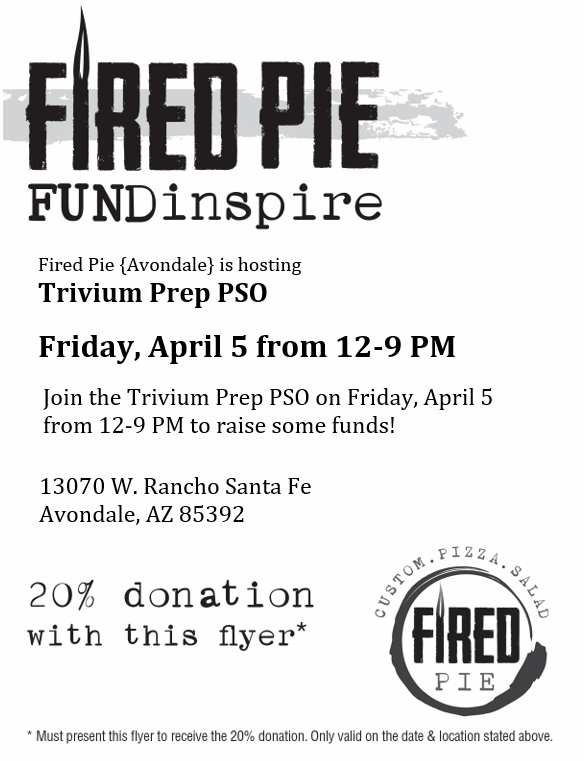 Email PSO President, Robert McElfresh at triviumpreppso@gmail.com with any questions.